A favorite amongst tournament Chess players, the INSA Wooden Mechanical Clock features the beauty and precision of European production. It is housed in a beautiful solid wood case and has the quietest mechanisms available on a mechanical Chess clock. It also features a revolutionary expanded last minute time-scale removes the guess-work and allows you to better manage your remaining time. 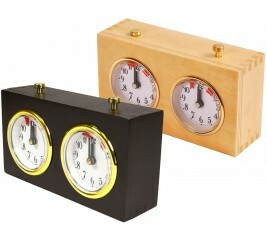 You won't find a more attractive wooden clock at this price ANYWHERE! 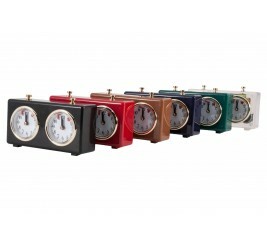 The BHB Special Mechanical Chess Clock is the finest mechanical plastic chess clock available! It has been handcrafted by the renowned craftsmen of BHB and is the gold standard in mechanical clocks because of its fine German engineering, simple classic appeal and sturdy construction. 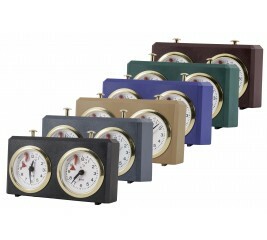 It is a traditional mechanical clock with a revolutionary expanded 5 minute time-scale on the clock face. This features removes the guess-work and allows you to better manage your remaining time in a time scramble. 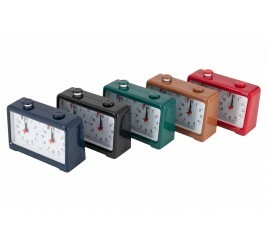 A simple to use mechanical clock, just wind-up the movement, set the hands, and you are ready to go! The housing is uniquely molded to allow the clock to sit at a slight angle for better, non-glare viewing. The movement is relatively quiet and the design is compact for easy transport. This basic clock is a must for serious tournament players or casual players who want to put a time limit on their games. This battery-operated Quartz analog clock is an economical chess clock which is reliable, accurate, easy to use, sturdy and has a large, easy-to-see display. 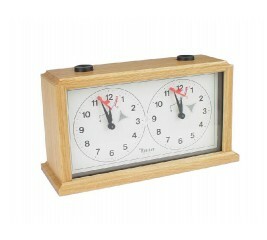 This clock is perfect for schools, clubs or casual play. No more over-winding problems. This basic clock is a must for casual players who want to put a time limit on their games.